(CNS): Certainly not happy about the mistaken endorsement from the PPM when CITN incorrectly attributed their paid programming to the party, the West Bay four however were delighted recently to receive an endorsement from Benson Ebanks. A former MLA and member of Cabinet, the well known community leader offered the four West Bay independent candidates his wholehearted support when he said he had heard what they had to say and he liked it. Telling the audience that he would keep his speech short, he said, “As Henry VIII said to one of his wives, I shan’t keep you long.” Ebanks, who still plays a role in the West Bay community and remains as Chairman of the Board of Cayman National, made the endorsement of Lana Mae Smith, Choppy Delapenha, Woody Da Costa and Paul Rivers at the independent’s joint meeting at Boatswain Beach on Thursday (14 May). “I have known these candidates for most of their lives,” Ebanks added. “They have pulled themselves up by their own bootstraps and when elected on 20 May they will apply those same qualities to representation of this district in the Legislative Assembly.” He said he would be voting for the four and hoped everyone else would do the same. Speaking on behalf of the four candidates Delapenha said it was an honour and pleasure to have the endorsement of someone of his stature, who he described as a statesman whose service to the Cayman Islands is unsurpassed. “Having Mr Benson’s endorsement is a strong testimony to the high calibre of representation which he feels that our four independent candidates can offer to West Bay in particular and to the Cayman Islands as a whole,” he noted. The four candidates have been quick to stress over the campaign that they are not a party, born out by they differing opinions on some political issues, but they say they have campaigned together in order to pool resources and because they have common ground in that they say they all agree that West Bay is in dire need of better representation. (CNS): In the final day of the tribunal to hear the case against Justice Priya Levers the lawyers drilled down to arguments of proportionality, fairness and even the question of all or nothing with regards to the tribunal’s terms of reference in relation to the Cayman Islands Constitution. Stanley Brodie QC (left) and Anthony Akiwumi argued on behalf of Levers that, given the most serious allegations that she was involved in the petition against the chief justice or was the author of the letters to Cayman Net News were not proven, there was no case for removal from the bench even if any of the other allegations were accepted. They went on to argue that, as the constitution only provides for the tribunal to recommend removal and nothing else, as far as constitutional law was concerned there was no other lawful route open to them to reprimand or conclude that Levers had still misbehaved in a way that fell short of removal. In short, they suggested that the Lordships had to either recommend removal or exoneration. Timothy Otty QC, however, said that while the Constitution might direct the tribunal to her removal, it does not expressly say they could not decide that there was still a question of misbehaviour. Presenting their closing submissions today (Monday 18 May), both sides wrestled with authorities, precedents and legal details regarding definitions of misbehaviour, inappropriate conduct, proportionality and fairness. Otty took the stand first and argued that there was a case to answer in terms of disparaging remarks about the judiciary and inappropriate behaviour in court but conceded that there was no proof that Levers had written the critical letters. He argued that despite the points of law raised in Brodie’s final submissions and his assertion that things were not proven, everything was still up to the tribunal to decide. He pointed out that the tribunal’s aim was to enquire and then to make recommendations to the governor. He noted that there was also a difference in opinion between the two sets of attorneys regarding the burden of proof and whether it should be based on the criminal burden of beyond reasonable doubt or based on the balance of probabilities. Otty suggested the tribunal could consider whether there had been a breach of the Bangalore principles by Levers (a code of ethics and conduct for judges) and if so how much of a damaging impact such a breach would have on the jurisdiction. Seeking clarification for Otty’s argument, Sir David Simmons, one of the judges sitting with Sir Andrew Leggatt on the tribunal, noted that the Bangalore Principles do not provide for sanction and in each case it is still for the jurisdiction in question to decide whether a breach warranted removal. Otty contended that if the tribunal were to consider the allegations against Levers regarding her comments in the criminal proceedings, the family court and criticisms around the court of her judicial colleagues and the chief justice, they may still consider this amounted to misbehaviour. He did, however, state that he was not submitting to the tribunal that Levers could be found to be the author of the Net News letters and as it was not part of the tribunal’s terms of reference to seek to identify who was the true author, but it was at least unlikely that it was Levers. Otty also noted as he closed his arguments that it was up to the tribunal to decide the issue of fairness and proportionality. Brodie opened the presentation of his closing submissions with that point of fairness and proportionality and said an issue that had been entirely overlooked was the fact that Levers enjoyed “a first class reputation” and what was being examined was a relatively small number of complaints. Notingthat judges are human, he said misbehaviour was not an easy concept to define. He noted that, taking the letters out of the equation, there were no specific charges. He noted that even if they were to find she had fallen below standard on occasion this was not grounds for removal from the bench. With no letters and no petition, Brodie noted the tribunal was left with a collection of allegations and complaints ranging “from pretty weak to some substance” but where not one alone would warrant removal. Both he and Akiwumi raised the issue of the latitude that judges must be allowed in order to maintain the independence of the judiciary and issues of freedom of speech. Presenting his argument that the Cayman Islands Constitution simply did not allow the tribunal latitude for any negative finding other than recommendation for removal, he cited the report of Dale Simons from the UK FCO. Simons had reportedly come to the Cayman Islands last year to conduct an investigation into the judiciary (something that had not until this tribunal been revealed to the people of the Cayman Islands). In her report, Simons had pointed out that there was no mechanism for reprimanding judges and the only option was a tribunal with a recommendation for removal. Unlike other jurisdiction where intermediate options have been put in place so that judges can be warned about their conduct, Cayman has no such system in the present constitution. Citing an authority, Brodie noted how easy it could be to criticize a judge and for them to become targets of campaigns by rivals, disgruntled litigants and the media, and he said the dangers of that were clear in this case with regard the campaign in Cayman Net News against the local judiciary. Talking of how Levers’ tribunal came about, Brodie said the chief justice’s decision was understandable given the position he was in, being hemmed in by his own staff at the court with the petition, attacked by the local media and then the hearsay that one of his own judges was criticising him. He said the chief justice had been “poisoned by false evidence". Levers’ defence team also argued that any disparaging remarks that could be held against her were all made in private and therefore could not be considered serious enough to bring the judiciary into disrepute. Backing his senior colleague, Akiwumi made a number of submissions from legal authorities and he also raised the reasonable expectation that Levers had following the memo regarding the transcript. He said that after her exchanges and discussions with the chief justice, her arguments and concessions to his points that matter had been laid to rest. She was appointed by him as acting Chief Justice when he was away in September 2007 further illustrating her belief that the matter was closed. The fact that they were resurrected following the accusations that she had written the letters, been involved with the petition and said disparaging things about her colleagues, none of which were proven, it was unfair for them to resurface. He suggested therefore it would also be unfair of the tribunal to consider them. The final argument between Levers’ legal team and Otty was the issue of what was left if the letters were set aside and if that in itself could constitute enough misbehaviour or falling short of standards to warrant removal. If not, they pointed to the constitutional issue that there was little else for the tribunal to do but to exonerate. Thanking all of the legal teams involved, Leggatt announced that the tribunal would consider the issues before them and make their report to the governor as soon as possible. (CNS): PPM North Side candidate Joey Ebanks has said that instead of the requirement for six months leave of notice from Boatswain’s Beach (Cayman Turtle Farm Ltd), as stated in his contract, he has agreed to act as a paid consultant for the same period. However, if elected he would not be able to accept the paid position offered by the Board but would still, in his role as MLA, offer advice to the new management team, as he would do for any government body. Ebanks resigned from his post as managing director of the company on 24 March, the day before Nomination Day when he was declared a candidate for the People’s Progressive Movement in North Side. However, news that he had received a substantial salary advance during the period that he was employed by the Turtle Farm emerged shortly afterwards. Ebanks told CNS that he has been asked to do an audit on advances by the chief financial officer of the TurtleFarm, but that he had no issue with paying the advance salary back. He also noted that when he resigned his position, he still had $18,000 or $19,000 vacation pay due to him. The terms of his separation from the Turtle Farm are being negotiated by attorneys, Ebanks said, and explained that because statuary bodies might be scrutinized by the complaints commissioner or the auditor general, they are now being very meticulous in taking advice from lawyers. Walton said the Board had not yet revealed full details of Ebanks’ salary advances since the matter had yet to be closed. “The Board will not prejudice its position nor take lightly its responsibility to protect the interest of Company and it shareholders by making premature statements on the remaining matter,” he said. Ebanks is running for the North Side seat long held by Edna Moyle, who officially nominated him for the elections. 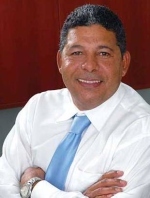 He is running against Ezzard Miller, a former minister and experienced politician, as well as Oswell Rankine, who previously ran for office in East End. Ebanks has himself taken to the hustings in the past when he tried his hand in Bodden Town in 2000 as independent.